This interview with the Ascended Master Isis is the fifth in the series that will continue at least until the end of December 2013. Karen was asked by the Ascended Masters, through our friend Soulou Rose, to make herself available for these interviews which were conducted by Chuck. Each interview is produced at 7:30PM CDT on Sunday nights and is immediately made available to subscribers and listeners. Isis(Greek: Ἶσις, original Egyptian pronunciation more likely “Aset” or “Iset”) is a goddess in Ancient Egyptian religious beliefs, whose worship spread throughout the Greco-Roman world. She was worshipped as the ideal mother and wife as well as the patroness of nature and magic. She was the friend of slaves, sinners, artisans, the downtrodden, but she also listened to the prayers of the wealthy, maidens, aristocrats, and rulers. 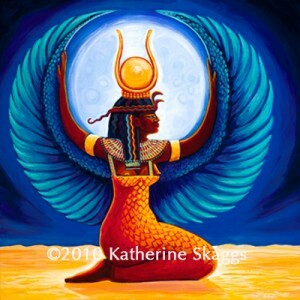 Isis is often depicted as the mother of Horus, the hawk-headed god of war and protection (although in some traditions Horus’s mother was Hathor). Isis is also known as protector of the dead and goddess of children.